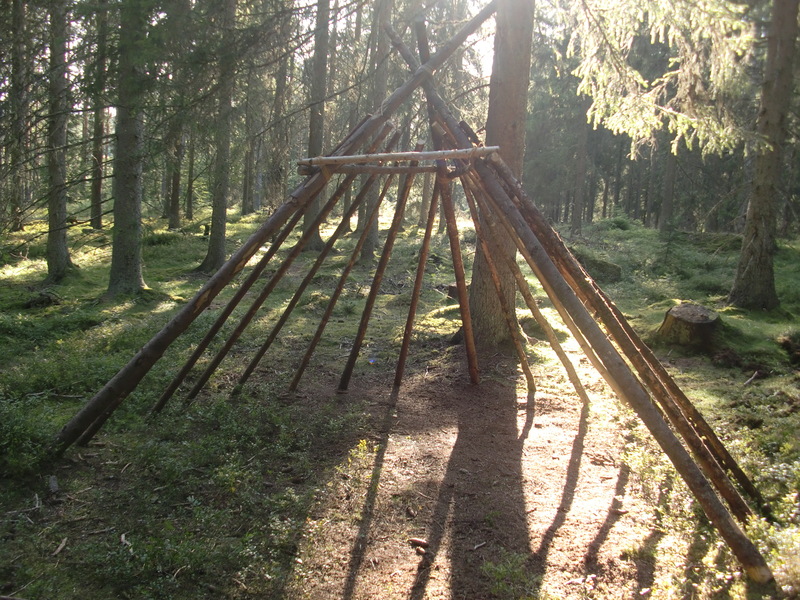 The most common shelter amongst the nomadic people of the north has always been what we call the lavvu. The reason for this is many and for the people using it has been their home and everything have had its place and there have been many rules what to do and not to do when being in one. Not much different from our modern homes, just smaller. 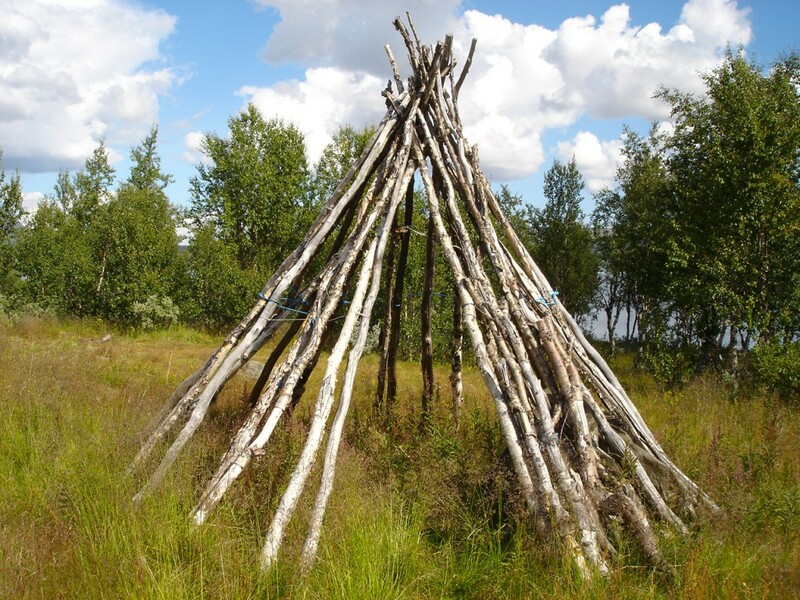 But this article is not how to live in a shelter like the lavvu, it´s how to make one. To make one you need 3 poles that can be lashed together and will become a big tripod. The Native Americans tipi is often lashed together in the top, but the Samii people have a way of doing this without using any rope or string. They use 3 forked poles (3-5 m long) that go together in the top and will in that way lock the 3 poles together. After that it´s not much more then put the rest of poles around and making a nice circle and then cover it up. 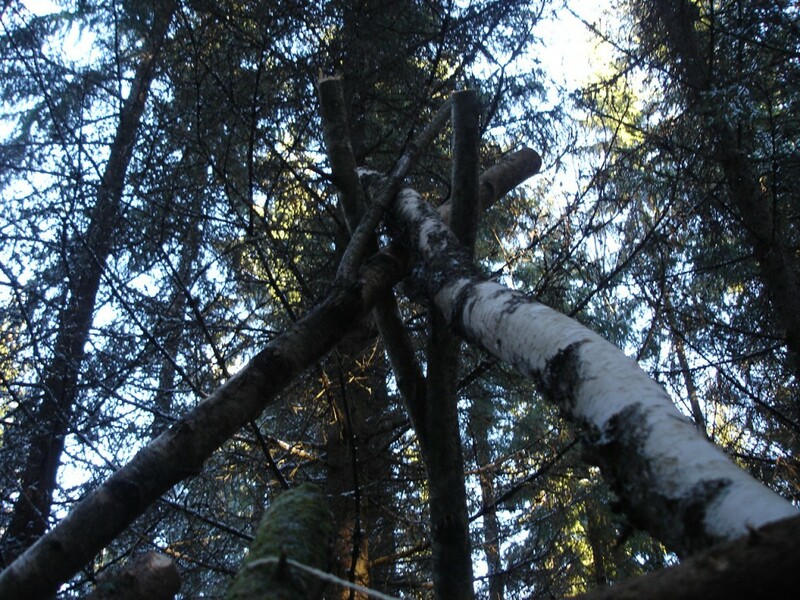 But when we now go out in the woods there is not always easy to find the 10-20 poles (or even more to make a large shelter that we need depending on the size of the shelter. What I prefer to make a “eldhydda” in translated to English would be called “firehut”. It is based on the same base as the traditional lavvu but instead of using poles going all the way up you put 3 crossbars about 1 meter from the top and then lean your poles against these. If you are careful and think before and save some of the branches in your 3 long poles the crossbars can easily just be put in place on the branches and will not need to be tied down. 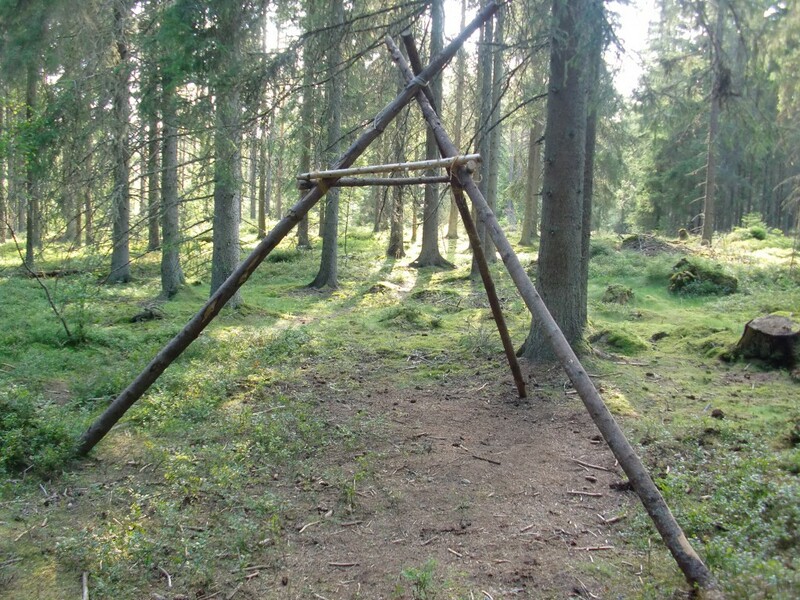 When you start adding your poles around your shelter make 3 half circles and in this way your shelter will be round and much bigger and without the cold corners. In an emergency you can cut down spruce trees with the branches on and just lean them against the crossbars and cut off the branches from the inside. To cover you lave up you can use a lot of different materials but most common is spruce boughs, but before you need to weave in sapling across the poles and then start weaving in the spruce boughs. Be warned it takes a lot of spruce boughs and take a lot of time to weave it all in so you can get it waterproof. During winter you need fewer boughs and can pile up snow instead that also will be a good insulator. Personally I use tarpaulins to cover up the shelter as it lasts longer and saves a lot of the forest. People always want to know how long something like this takes, well if you have all the poles you can do it a in a few hours. Otherwise it will take a lot longer since you need to find and cut down all the trees needed and as we discovered on a winter survival training a few years ago a small foldable saw is the most efficient tool for this. Have I missed something or you have a question about making these, just ask! At the moment there are one of these shelters are up at the camp, so if you passing by and want to have a look, let me know. 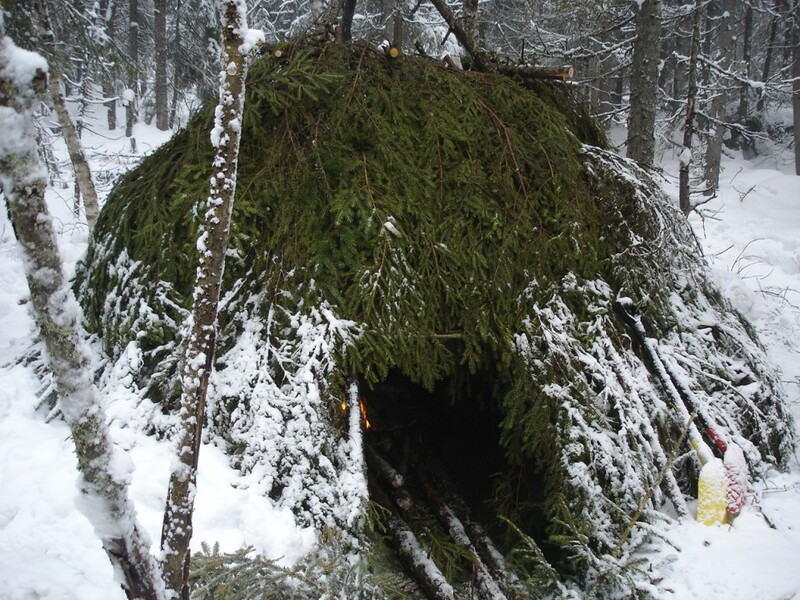 Detta inlägg postades i Nature, Ute och omkring och märktes Bivack/skydd, Lavvu, Samii den augusti 8, 2011 av Johan, Nordic Bushcraft.